Well, I’m not one to brag but sometimes I just have to toot this old horn of mine. For, this is my 200th post. And, maybe that’s not a big deal to some, but to me it’s the cat’s pajamas. The bee’s knees. For, in the nearly two years that I’ve been blogging, I never thought I’d get this far, and I certainly didn’t think I’d have this much to say! Why, that’s more than 180,000 words on topics that run the gamut, from silly to the ridiculous to plain borderline crazy. 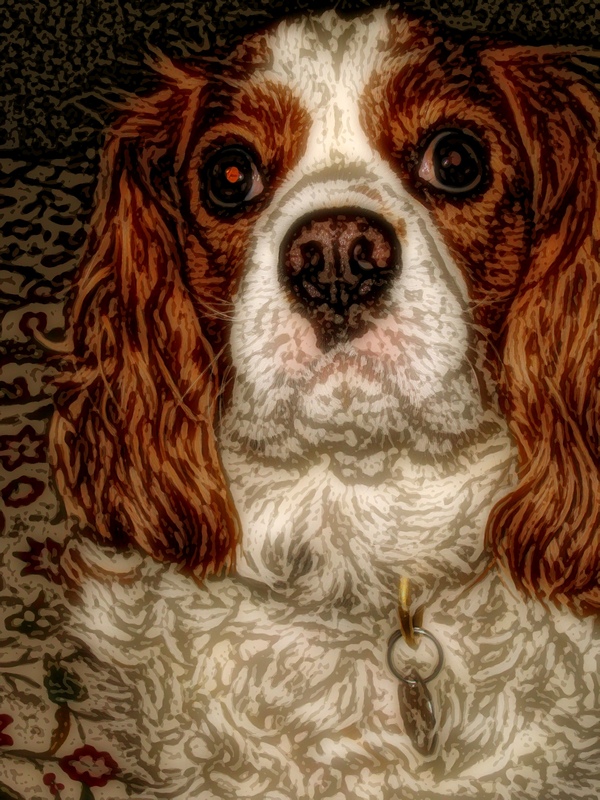 Of course, Henry, my Cavalier King Charles Spaniel, did help. He’d tell you himself, but he’s in a funk right now as the reality has finally dawned on him, that he’s not going to make it to the Queen’s Diamond Jubilee. Worry not, I told him, for he’ll be able to watch it all on The Today Show, and everyone knows how much dogs love to watch Matt Lauer globe trot around the world (not really). He’s living the dream, Henry says, rolling his eyes. In other news, allow me to fill you in on how I did with my Fifty/Fifty Challenge in May. I’m getting close to the halfway point, so you’d think by now I’d be honing in on the midway mark to my Fifty/Fifty goal. 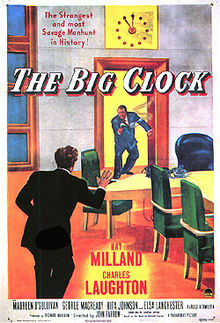 Yes, the clock is ticking, the year is running its course, and right now I’m feeling like Ray Milland in The Big Clock. That’s the 1948 film noir thriller, in which Ray Milland plays a hapless guy whose boss’ mistress is murdered and Ray Milland becomes the number one suspect, caught in a web of deceit, jealousy, intrigue, power and corruption. Add to that, poor Ray has mere hours to find the real killer (his boss) or get the book thrown at him. Yep, that’s me. Except instead of facing a murder rap, I’m facing a stack of unread books and a TiVo, so stuffed with films I’ve yet to see, I need a plunger just to get the darn thing working. Dark Shadows: If you haven’t seen this latest film from Tim Burton, starring Johnny Depp, run, don’t walk to the nearest theater. It’s absolute fun. A fond tribute to the campy classic by the same name, back when soaps aired live and props and scenery would fall on the set during what was supposed to be a serious scene. Depp is in high form as the 200-year-old vampire, Barnabas Collins. Other films I got to see in May? 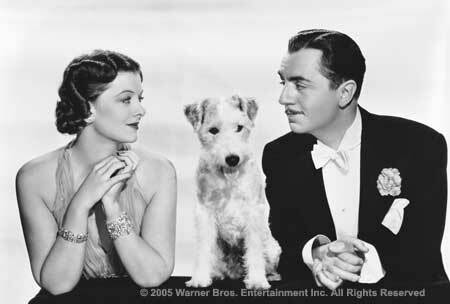 Two that celebrate amore in all its glory: Love Story and Lady and the Tramp. Yes, Lady. The story of a Cocker Spaniel and the mutt that befriends her. Look for the spaghetti scene. Awfully cute. Now, as for Love Story, I have to wonder why it was such a big hit at the time—a blockbuster, even—but then I remember that those were different times. I really tried to like it and I almost did, but, for crying out loud, couldn’t Jenny Cavalieri, played by Ali McGraw, have a little backbone? Wasn’t this the height of the feminist movement, after all? And yet, Jenny gives up her dream of studying music in France, just to marry a petulant boy who hates his father. Then, when Jenny gets a fatal disease, the doctor alerts her hubby, Oliver—and not Jenny. She’s kept in the dark!! The doctor even tells Oliver to try to keep the news from her for as long as he can. What’s wrong with this picture? Shouldn’t Jenny know that she’s dying, so that she can make her final arrangements and say her goodbyes? Yikes, I hope Hollywood isn’t planning a remake, as I’m not sure it would fly today. What do you think? Move over Eloise and Fancy Nancy! There’s a new girl in town and her name is Livi. Like her two predecessors, Livi is a girl after my own heart. The kind that is creative, sprightly, and capricious. Dare I say this pint-size tyke is “Livi-acious?” What’s more, she’s about to take a bath—ready or not! On My Way to the Bath, is a new children’s book written by comedian and blogger, Sarah Maizes, and is sure to delight young and old. For Livi will do anything to get out of taking a bath, even if it means having to transform into a snake, or perform a tuba solo in a marching band. Anything, to avoid the dreaded tub of water. Livi hits a nerve for me, as I can remember many a time I didn’t want to take a bath and all the bubbles in the world couldn’t lure me into the bathtub. I only wish I’d had an ounce of Livi’s moxie to keep my bath time at bay. In the end, Livi dipping a foot into the bathwater is inevitable, simply because everyone needs a bath at some point, right? But how will she get there? What will it take? That is the point of the story and remains to be seen. To find out, you’ll just have to read the book! So, tell me. What movies did you see or what books did you read in May? Friends, the saga continues. It pains me to tell you, but I can hide it no longer. There is a clown in my psyche screaming to get out. I know this because I have uncovered something, which is more ghastly than the birthday greeting card I received for my sixth birthday. There’s no easy way to say this, so I will let you see for yourself. After all, one picture is worth a thousand words. Or in this case, three pictures. Yes, I am secretly obsessed with clowns. So hush-hush is my obsession that even I did not know about it. I have been deluding myself and now I am coming clean. 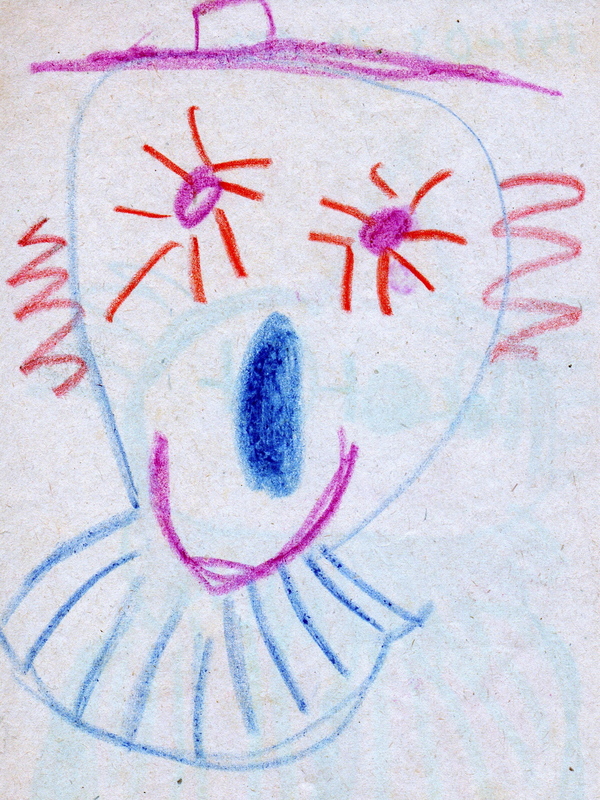 Apparently, as a child, I’d draw these pictures of clowns over and over. Incessantly. Ad nauseam. And these are just the tip of the iceberg. What does it mean? I wish I knew. Which brings me to the latest clown terror in my life. 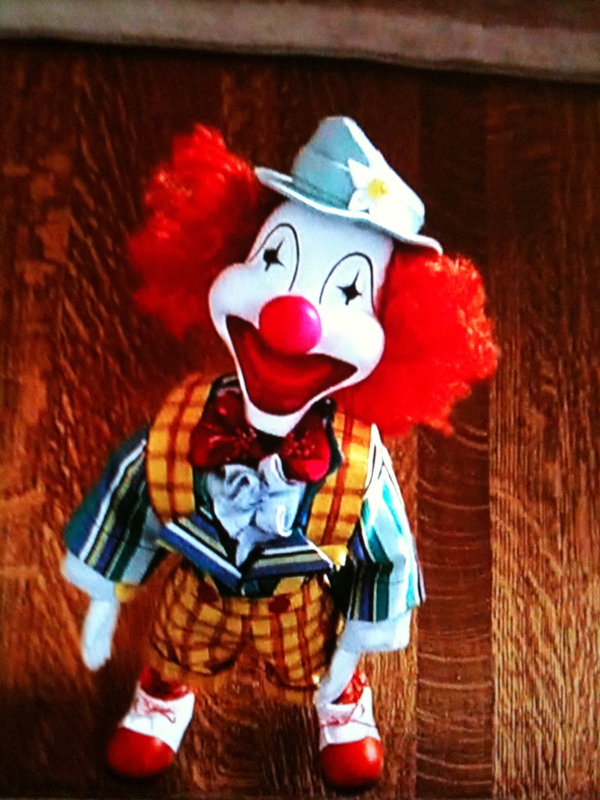 I’m talking about the creepy, maniacal toy clown, that has firmly planted its over-sized clown feet, smack in the middle of our pop culture. It’s a toy clown gone postal! And we can thank the United States Postal Service and its ad agency for this addition to our collective consciousness. The U.S. Postal Service clown. Could anything be scarier? Well said, Johnny. Well said. But Mr. Depp wasn’t referring to the toy clown in the Postal Service commercial. According to a blog post, Top 10: Scary Clowns of All Time, he once shared this insight in an interview with The San Francisco Chronicle. But, if you ask me, he might as well have been talking about this particular clown gone postal. For the few who haven’t seen this commercial, in it, an unassuming family of four has just returned home to find an ominous toy clown on their living room floor—apparently the result of an online purchase gone awry. Too afraid to go inside the house, they talk to a mailman about how to get rid of it. Each time the camera pans back to the clown, it has mysteriously moved closer to the family, ultimately terrorizing all, even the hapless mailman. The Postal Service commercial is frightening, and yet I find myself obsessively drawn to it each time it airs. Perhaps I’m hoping for a different ending, one where the toy is vanquished. Whatever the reason, this shocking commercial rattles even the hardiest of psyches. It should only be played late at night when little children are asleep. 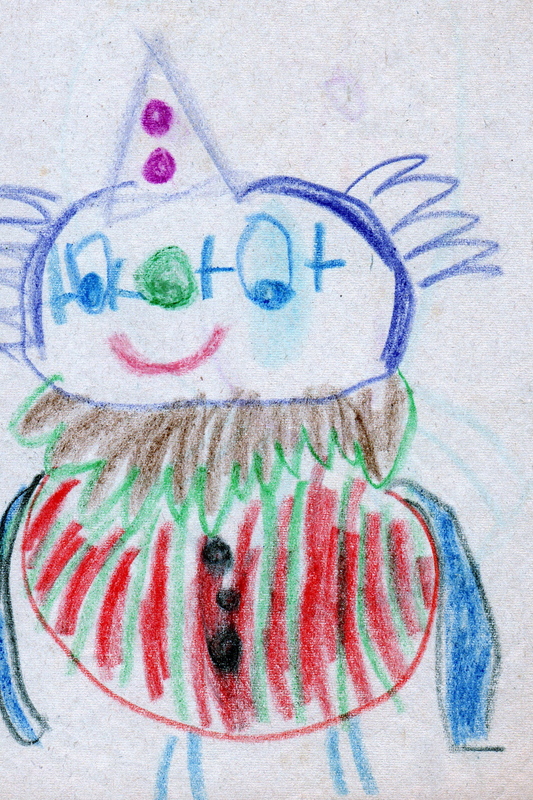 Because the next thing you know, they’ll be drawing pictures of clowns. Again and again. Ad nauseam. It’s a vicious cycle. So maybe I’m obsessed with clowns. Maybe there’s a clown inside me, screaming till its curly orange hair stands on end. If so, I take solace in knowing that I am not alone in my phobia. There’s a website, and a Facebook page called “i hate clowns”—with 6,670 people who “like” it, including myself. Our fear has a name: coulrophobia, which means, a persistent, abnormal, and unwarranted fear of clowns. Unwarranted? I don’t think so. We coulrophobia-sufferers know better.